Hey guys! Hope you all had fantastic Holidays, and are having a super awesome start to 2019! What could be better on a snow bound Saturday than some light reading, right? I wanted to fill you all in on all of our current updates and the road to OPENING the Ghost! If you aren’t up to speed with all of our new happenings just go back a blog post to catch up! Our Top Nine for 2018! Although anything can happen, we are looking at a Mid-Late February Opening. I know that this is pushed back from our original idea of opening dates, but that is to be expected doing a full commercial kitchen remodel. The rule of thumb is always expect the unexpected & unplanned, and never start major projects when the Home Improvement Stores are closed. (Lesson learned) This next month is going to get even more intense, but we’re ready for it for sure. We finally got to move in our “new” sofa that Danny & Felicia brought to us (SWAT Food Truck) We just refinished it, and it looks incredible against our new gorgeous blue walls!! Since our last blog post a lot has happened! Our Entry Room is pretty much complete at this point, with the exception of some minor electrical work, and laying down new tile for the pick up window. Otherwise, we have begin to start moving furniture in, which is so exciting to finally be at this point! A total transformation of this space is a complete understatement - it doesn’t even look like the same room now! Next up, PLANTS! We are also undergoing a full transformation & rebrand on the back-end of our business too. For starters, Betty is going to be getting redesigned & wrapped this year. Although certain elements of “OG Betty” will still be present, she’s truly going to look like a brand new food truck. I won’t give away too much just yet, but I can say that we are SO incredibly excited to be working with one of our absulutely favorite fellow small business owners & local tattoo artist, Logan Bramlett, Owner of Wanderlust Tattoo Society. Get ready for a complete surprise guys, as always Logan is knocking it completely out of the park! All brand new Catering Packet - Contact us for more info! Naturally, with a full rebrand underway, a brand new space & kitchen, it also means a menu revamp. We just completed our all BRAND NEW awesome Catering Packet with info for the Food Truck, Buffet, Family Style & Plated options. Interested in learning more? CONTACT us for more info. Award Winning Korean Burger. Oh Yes. But that’s not all, our menus for the Ghost Kitchen will also feature some new items like Build Your Own Ramen Bowls (What!? YES. YES. You read this right!) To bringing some of our most requested menu items back like our Korean & Guajillo Burgers with housemade pub chips, Fried Chicken Pancake Tacos, and even offering “Weekly Secret Chef Specials” for the adventures types, OF COURSE also your through and true favorites like Homemade Mac & Cheese w/ Pork Belly, Poutine, Rice Balls, Polenta Cakes, Brisket & Gnocchi and yes, SPROUTS (with a burnt honey & bacon upgrade option too!) can be found too. I KNOW. We’re ready to get open too. The Ghost will start off with roughly 16 menu items, and we will continue to add the remainder of the menu as we see fit and get comfortable into a new groove. As always, you can absolutely expect to find gluten free, vegetarian, vegan & dairy free menu item options as well. Always. 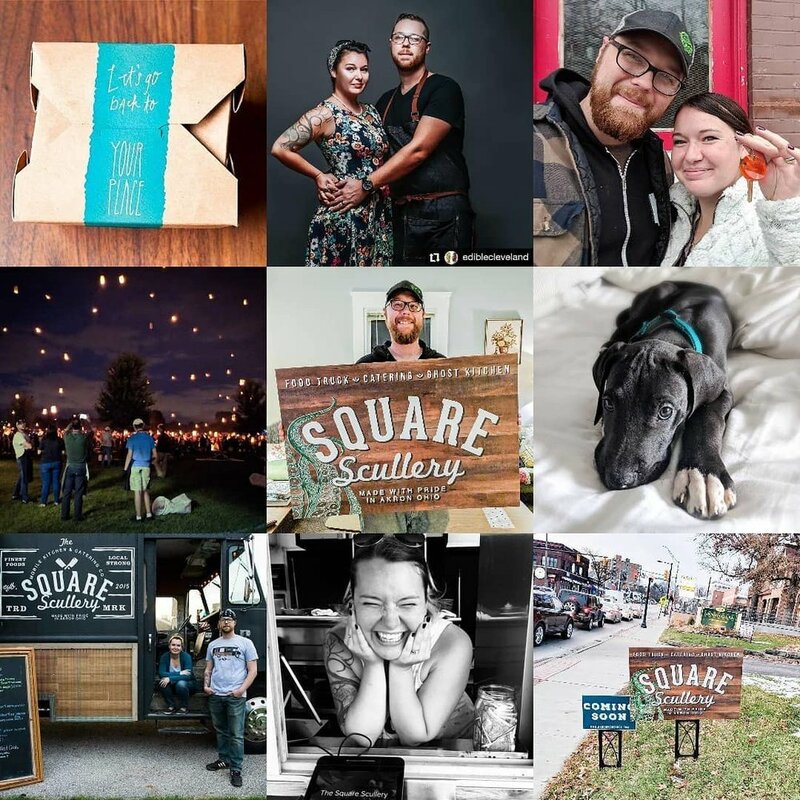 We plan on bringing in a handful of amazing local small business owners & local purveyors into the mix as well with time, but information on all of that will be in the next blog update. Alongside with amazing fellow wedding vendors, we were featured on Carots & Cake this week! A super huge thank you to The City of Akron, Danny & Felicia of SWAT Food Truck, John & Kevin of Hudson’s & Beachcomber Food Truck, Craig & Michelle of Sauced Fire Wood Pizza, Juan of Wholly Frijoles Food Truck, Lena of Betty’s Bombass Burger’s Food Truck, Dave Ulichney (for being willing to take the use of abuse of another build out) Jay & Josh Price for being the best random equipment movers at weird hours of the night, and also to SO MANY other amazing people who have helped along the way, there are truly almost too many people to name right now. Words can’t express how much we appreciate everything that you all have done, we love you all very much. To be continued soon!